The contents of this website and site pages (“Website”) is not directed at any person in any jurisdiction where (by reason of that person’s nationality, residence or otherwise) the publication or availability of the Website is prohibited. Persons accessing the Website need to be aware that they are responsible themselves for the compliance with all local rules and regulations. All product related information on this Website is solely intended for professional investors within the meaning of the Dutch Act on the Financial Supervision (Wet op het financiëel toezicht) or persons which are authorized to receive such information under any other applicable laws. None of the funds are registered under the Securities Act 1933 of the United States or under the Investment Company Act of 1940. The details on these funds as shown are not an offer for sale or to be sold in the USA, its territories, possessions or protectorates under its jurisdiction, nor to nationals, citizens or residents in any of those areas. Neither information nor any opinion expressed on the Website constitutes a solicitation, an offer or a recommendation to buy, sell or dispose of any investment, to engage in any other transaction or to provide any investment advice or service. An investment in a fund referred to on this Website should only be made after reading the related legal documents such as management regulations, prospectuses or other applicable terms and conditions, annual and semi-annual reports and after obtaining investment advice. Although FMO Investment Management B.V. ('FMO IM') aims to provide accurate, complete and up-to-date information, obtained from sources of information believed to be reliable, no warranty or declaration, either explicit or implicit, is given as to the accuracy or completeness of such information. Persons accessing the Website are responsible for their choice and use of the information. The value of your investments may fluctuate, and past performance is no guarantee of future results. Funds on the Website may invest up to 100% of their total net assets in unlisted and/or illiquid investments deriving from so-called developing (emerging) countries. This can involve specific risks of which investors should be aware, among which risks related to political and economic stability, currency exchange rates as well as applicable foreign taxes and accounting standards. Any other products or securities that are mentioned on this Website have their own particular terms and conditions, which also should be consulted before entering into any transaction. FMO IM as well as (possible) other suppliers of information to the Website accepts no responsibility for the contents of the Website or the information or recommendations contained herein, which moreover may be changed without notice. FMO IM assumes no responsibility for ensuring, and makes no warranty, that the functioning of the Website will be uninterrupted or error-free. FMO IM assumes no responsibility for the consequences of e-mail messages regarding a FMO IM (transaction) service, which either cannot be received or sent, are damaged, received or sent incorrectly, or not received or sent on time. Neither will FMO IM be liable for any loss or damage that may result from access to and use of the Website. The information on this Website is based upon sources of information believed to be reliable. FMO IM is not answerable for the accuracy or completeness of the facts, opinions, expectations and results referred to therein. Whilst every care has been taken in the preparation of this Website, we do not accept any responsibility for damage of any kind resulting from incorrect or incomplete information. This Website is subject to change without notice. The information contained on this Website with respect to financial products or financial instruments may reflect a situation as per a specific date only and such situation can or will therefore be subject to changes. Please refer to the prospectus of the funds, information memorandum, or, where available, the key investor information document made available for further details. All copyrights, patents, intellectual and other property rights, and licenses regarding the information on the Website are held and obtained by FMO IM. These rights will not be passed to persons accessing this information. FMO IM guarantees that the data of persons accessing the Website will be treated confidentially in accordance with prevailing data protection regulations. Such data will not be made available to third parties without the approval of the persons accessing the Website, unless FMO IM is legally obliged to do so. However FMO IM and companies belonging to the same group may use the personal information collected in the Website as well as technical and browser related information such as the type of browser, IP address, the pages read and the average time spent on the Website for administrative purposes related to investments or any linked activity. FMO IM with its principal place of business located at Anna van Saksenlaan 71, 2593 HW, The Hague, the Netherlands, and registered in the trade register under number 62649108. 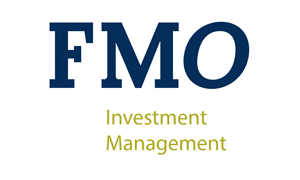 The Netherlands Authority for the Financial Markets in Amsterdam has granted FMO IM a license to provide the following investment services: to (i) receive and transmit orders, (ii) manage portfolios and (iii) provide investment advice.